I like to cook at least one gourmet dinner a year in order to improve my techniques and flavor profiles. This year I tried to incorporate more "molecular gastronomy" techniques in the form of food powders and pliable chocolate ganache. I also wanted to showcase some colorful vegetables for this summer-themed dinner. 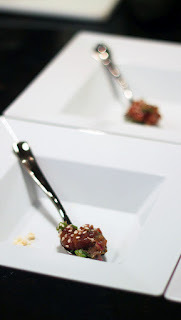 First up, an amuse bouche comprising Yellowfin Poke with Sesame Oil Powder. Sesame Oil powder is easier to make than it sounds. I didn't have any tapioca maltodextrin on hand, so I substituted tapioca starch instead and it worked fine. I basically added sesame oil to tapioca starch in a small food processor until it achieved the desired consistency and fragrance. Finely dice the green onions, red onion, ginger. Finely cube the yellowfin tuna. Serve sesame oil powder with the tuna poke.